It was raining. Actually, it was pouring. The tail end of Hurricane Patricia. A cold wind was blowing. I had on my water resistant winter coat with the hood up. I parked my car in the Sobey’s lot. The spot next to me had a grocery cart in it. I dashed for the market’s door, head down. It took only a few minutes to grab what I needed from the pharmacy shelves. I paid at the self check-out, refused to pay five cents for a bag, and carried my three articles in my hands. Out into the cold rain again, this time full in my face. What is this? The grocery cart is now snugged up against the rear of my little red Yaris, and a woman is getting out of the car that is now parked next to me. It is nose out. The space behind is empty. She has moved the cart, and put it in behind my car, so she doesn’t have to back out of the space behind. I’m really old, but I’m not the silent type. I start cussing her out as I throw my purchases onto the front seat. “Thank you very much,” I conclude, as I seize the cart and begin the long trek to the cart depot. She has paused in her open door. I refuse to dignify her by looking at her, but I’ve got her number. I’ve hexed her day before I can stop myself. As I wait at the light, I back-pedal hex-wise. I pull back from a really bad day hex to a moderately bad day hex. By the time, I pull into my driveway, I really want to stop the hex altogether. Too late. She’s already ashamed. But still self justifying. How was she to know I was almost eighty, and wouldn’t come out with a cart of my own? She just thought I could return the errant cart when I returned my own. Okay, back to plan B – a moderate hex on a miserable day. This entry was posted in Hallowe'en, humor, Uncategorized and tagged grocery cart, rainy day by joyceahowe/hood. Bookmark the permalink. 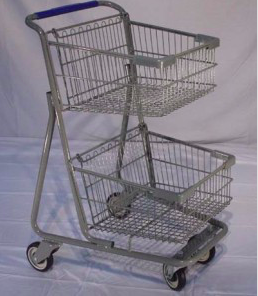 Oh, I don’t know……perhaps her intents were not so community-minded and she was only interested in moving the cart out of her way as opposed to putting it in a position to be conveniently returned……..in my hex-book you are a generous hexer!! !